What could be better than watching your favorite Disney movie? Watching your favorite Disney movie under the stars! Now available for all Walt Disney World Resort guests are MOVIES UNDER THE STARS! This fun activity is available at all Walt Disney World Resorts at no extra cost to guests. These Rated-G and Rated-PG movies range from some of your old favorites like Peter Pan and Dumbo to some of the more recent Disney movies like Tangled and Frozen. Different movies will be offered throughout the month. While you can bring your own chair or blanket, many resorts offer seating on benches or beach chairs. There’s no need to limit yourself to your own resort. You are welcome to travel to any location offering these family-friendly flicks and join in the fun! Some resorts toss a little extra Pixie Dust in to the evening with dance parties and/or campfires. The most elaborately themed campfire/movie can be found at Disney’s Fort Wilderness Campground and Resort. 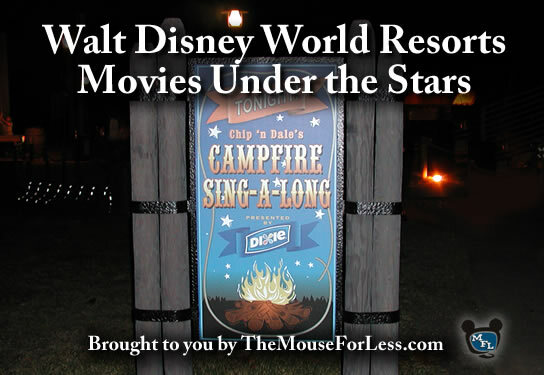 Here you can sing-a-long with Chip-n-Dale, purchase a S’mores Kit, make yourself some S’mores and then sit back, relax and watch the movie. Activities at each resort include pool activities, fun for the whole family, special events at your resort, and more. Most resorts host a Disney Junior themed pool party each day. Look for games, crafts, contests and more to be held and the resort pools. Remember that guests are not permitted to use pools at a resort where they are not a registered guest. Sister resorts such as All-Stars and Port Orleans Riverside and French Quarter are exceptions to this rule. The guide below lists the Movies Under the Stars location at each resort and provides a link to each resorts monthly Activities Calendar. The calendars change each month, so be sure to check back during the month of your visit. See Activities Calendar for alternate locations for Movies Under the Stars and other activities in the event of inclement weather. Movies Under the Stars and entertainment are subject to cancellation or change without notice.